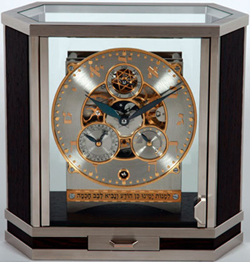 Russian watchmaker Konstantin Chaykin announced a new desktop clock “Shabbat” with the Jewish calendar. Excellent meters time with a particular religious-themed watches are the most popular brands. By applying the latest technology and years of experience in creating complex watches founder Konstantin Chaykin was able to attract the attention of the audience watch daring technical and design solutions. After the recognition of Orthodox astronomical clock “Resurrection” with the Easter calendar, Konstantin Chaykin watches presented “Al-Biruni” and “Lunar Hijra” with the Muslim calendar. In 2012 this company has released a new desktop clock “Shabbat” with the Jewish calendar and time complexity, which allows the user to never wind the watch on a Saturday, but even if the watch stops, it will happen within 5-6 hours prior to the onset of the Sabbath. In all new external design touches and used parts, designed to remind us of Judaism. Silver Dial is in contrast to the gilded hour indices and graceful in form with blue arrows, the color which symbolizes compassion and spiritual Jerusalem. Time marks are alternated with golden letters of the Hebrew alphabet. Kabbalistic themes and used to create an exclusive mechanism TSB 01-1 – one-minute tourbillon is shaped like Stars of David. The unique mechanism of 120h150h47 size, 5 mm consists of 440 components and hand-polished and polished. The mechanism is complicated function of the “Sabbath” (the patented device is the inclusion of additional plant) and has a calendar that displays the date, day of week and month on the calendar of the Jews. The massive display of moon phases is set in the center of the dial. Collected by 17 stones, balance sheet size has a frequency of 18,800 vibrations per hour.